I’m sincerely admired how it’s possible to find space for everything and what original solutions it required. This apartment interior advantages will best reflect not in the photos but in video below. 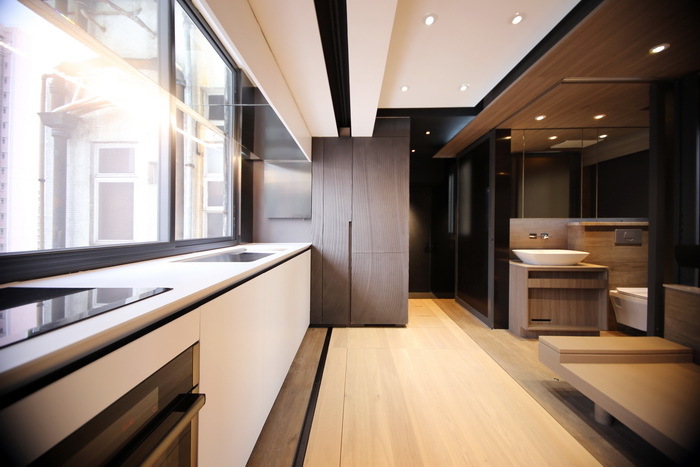 The interior has been planned up to the smallest detail where there’s everything what the couple living in there wanted. 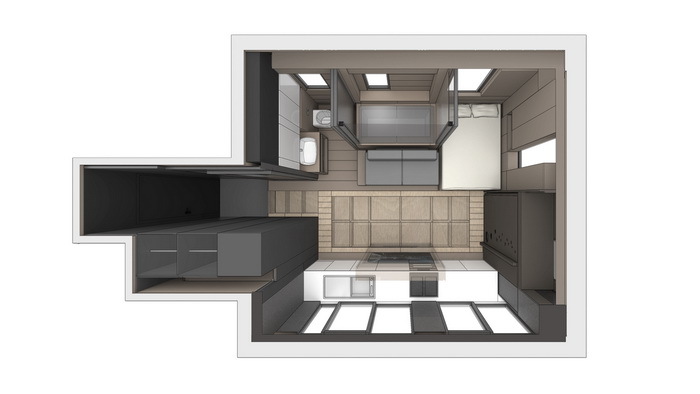 They wanted to have a kitchen, a normal-size-bathroom, home cinema system, the place for sports and 3 cats and a lot of space to keep different items. 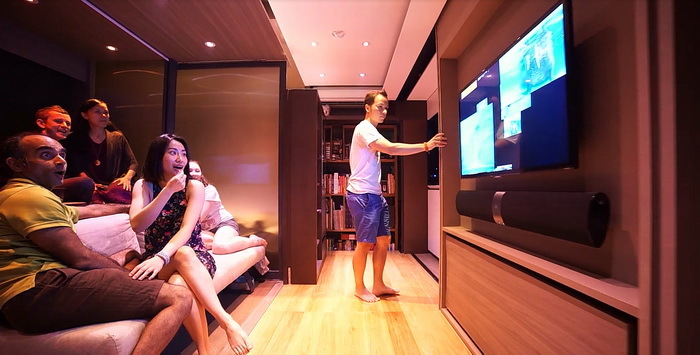 There’s nothing surprising that the couple decided to invest into space-saving solutions, as they decided to live in one of the most expensive places – in the centre of Hong Kong. I’m sincerely admired how it’s possible to find space for everything and what original solutions it required. For example, depending on a situation the bathroom can serve as usual bathroom and if there’re guests – it remains separate so that it was possible to freely use the toilet and washbasin till somebody is in a bathroom or is lying on a bath. Yes, it didn’t appear to you – lying on the bath! One more, the strangest scenario of using a bath that I’ve ever seen, is a bed-sofa that is useful when the movies are watched or somebody stays there for a night. As you see, a lot of people fit in there (I see 7 in a photo), I’d just probably bet which one will sleep over the bath – one should get used to the thought that there’s an empty space under you. What is more, each guest has his space, as the bed of hostess as well as a bedroom in a bathroom close from the extrinsic eyes. So that such space flexibility and uniqueness were reached, architects had to examine around 30 various different versions and continuously experiment. Even 4K curved TV fits here! People didn’t resist their wishes just because of the lack of space, but everyone has different priorities here. Everything is applied so for customer needs that it’s nice to look there – even kitchen mixer can be taken out so that it’s possible to open the window. Each cabinet has been thought up to the smallest detail, a woman even has a mini makeup table! 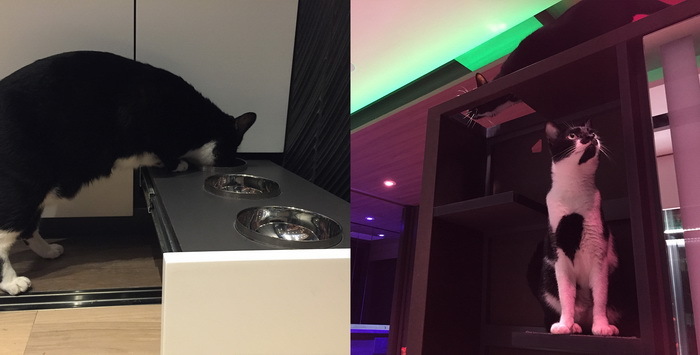 Both the floor and the place under ceiling has been purposefully used – the cats have a lot of space where they can walk, probably only a drawer with a bowl of food is a bit too luxurious for them comparing with the space but it’s only my opinion. Their litter tray has their ventilation system so that there were no bad smells in a flat! There's also color changing lighting… In other words, please see yourself, as there’s indeed where to look at. Older post Record - just 15 sq.m apartment!